A couple of blog entries ago, I wrote on the waning of the Populuxe era and the early days of the psychedelic era, discovering the transitional linkage between the two eras in the image of the New York World's Fair that opened in April 1964. The New York World's Fair, the mediocre reception of which marked the end of the Populuxe era (1954-1964), was also the final destination of Ken Kesey and the Merry Pranksters, who started out on the world's first acid road trip headed for New York on 14 June 1964. The linkage between these two events was unexpected but revealing, providing us a convenient means to date the beginning of "a new era." As Katie Mills has observed in her fine book, The Road Story and the Rebel (2006), it was a consequence of the Merry Pranksters' cross-country excursion that the word trip "took on a double meaning that was part of the era's playfulness with language--to travel as well as to take LSD or blow one's mind. In the Prankster's league, the two became one" (86). For novelist Ken Kesey--by 1964 famous as a result of the publication of One Flew Over the Cuckoo's Nest (1962) and the about-to-be published Sometimes a Great Notion (1964)--part of the explicit purpose of the bus (to be entirely accurate, a 1939 school bus) trip was to make the record of a transformative journey, which is why the Pranksters took along with them film cameras and tape recorders. As Mills observes, "One goal of the Pranksters' road trip was to expand their expressive possibilities by making a film while on the road, to push further than the novel in order to break through to new expressive and artistic forms" (85). Of course, this film, which Tom Wolfe refers to as The Merry Pranksters Search for the Kool Place, was never completed, despite Ken Kesey spending years (and many thousands of dollars) trying to finish it. Hence, the only record we have of the Pranksters' journey is in the form of Tom Wolfe's New Journalistic account, The Electric Kool-Aid Acid Test (1968). But... fortunately for both scholars and for posterity, footage of the Pranksters' trip has been released on video through Zane Kesey's (Ken Kesey's son's) website, key-z.com. What this footage reveals is the remarkably accurate account of the journey Tom Wolfe made in his book. As Katie Mills observes, by means of the deliberate redundancy in the diction between these two passages, Wolfe explicitly links The Merry Pranksters Search for the Kool Place with the Beatles' Magical Mystery Tour. Although no indubitable connection between the two films has been definitively established, Bob Neaverson, in The Beatles Movies (first published 1997), suggests that Paul McCartney, flying home from America in April 1967, very easily could have read Tom Wolfe's first articles on the Merry Pranksters' bus trip, published in the World Journal Tribune in January and February 1967 (not to be confused with the book publication of Wolfe's account, which was August 1968). Magical Mystery Tour was filmed in September 1967. There are no hard feelings, apparently: according to Mills, the Pranksters "like to claim credit for this inspiration--they seem genuinely happy for the Beatles' success with what may well have been their idea" (103). The idea? The world's first acid road trip. 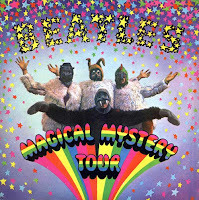 That Magical Mystery Tour was widely panned by the critics when it first aired on December 26, 1967, reaffirms an insight I made a few blogs ago on why early psychedelic albums failed--the audience didn't yet exist. The psychedelic aesthetic, largely non-narrative, more lyrical and abstract, and prone to making startling, sometimes surreal juxtapositions, had to be learned. Taste is not innate; it has to be developed.